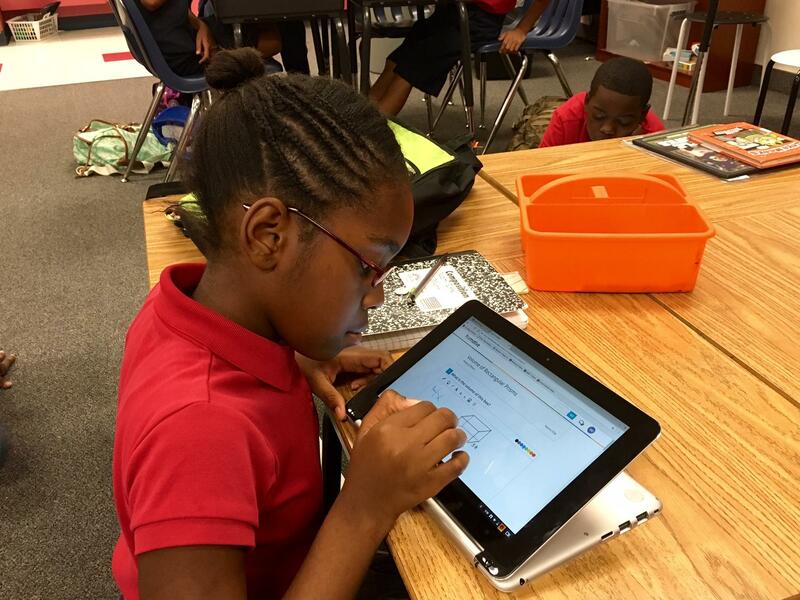 A fifth-grade student at McWhorter Elementary Schoo works on a math problem using a Chromebook. Just about everyone is using technology, and kids are practically experts. The issue for teachers is how to get kids to use these digital tools effectively in the classroom. KERA visited one elementary school in the Carrollton-Farmers Branch district that’s finding technology can help students learn. At McWhorter Elementary School, fifth graders in a math and science class are piecing together colorful plastic, Lego-like cubes on their desks. They’re building geometric shapes and mimicking what they see on their laptop screens for an online quiz. Jayla Parker, 10, looks at the image of a rectangular prism and reads a question out loud. 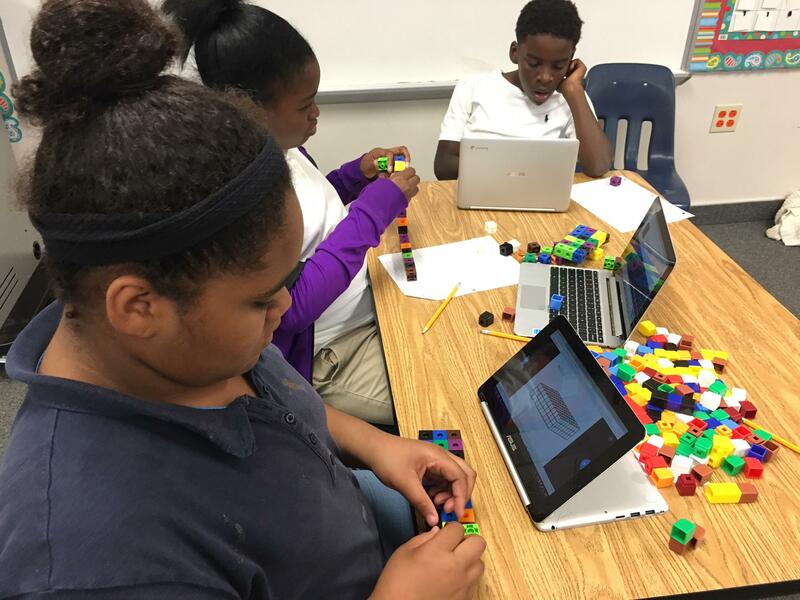 Students at McWhorter Elementary School in the Carrollton Farmers Branch school district use colorful, plastic cubes to assemble the image they see on their screen. The students are trying to solve a math question about volume. Jayla and her classmates work through the problems on their Chromebooks and submit their answers online. Their teacher, Klarissa Cardenas, created the quiz through an online program for educators called Nearpod. Cardenas says this digital approach is better for her students. She says they already love using devices like laptops and tablets, so they’re more engaged when they use them in class. The teachers benefit, too. They don’t have to spend extra time grading papers at home after school hours. “As a teacher it gives me more time to go back and look and it gives me more time to assess them and I can go back and help them to see better what they need,” Cardenas said. The University of Texas at Arlington offers an online course for teachers on how to best use emerging technology in the classroom. More than 3,100 people from 139 countries took the class. Peggy Semingson is associate professor of curriculum and instruction at UTA. She consulted with Andrew Berning, a K-12 analytics research scientist, to help develop the course. Semingson also said educators should tailor the technology to help students who need it the most — students with learning disabilities or students who are learning English. But she warns teachers should be mindful of how often devices are used in the classroom. Yanet Cardoza is the principal at McWhorter Elementary. She encourages her teachers to use new technology in the classroom. 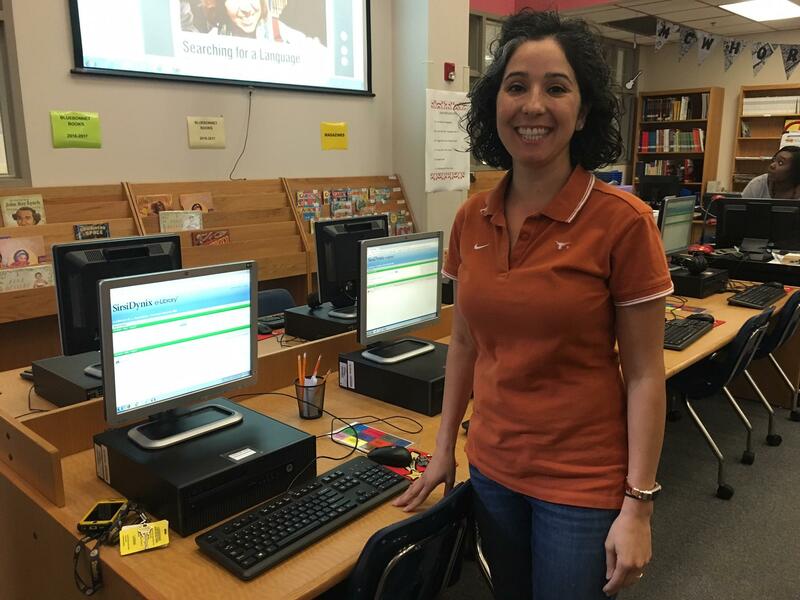 At McWhorter Elementary, Principal Yanet Cardoza encourages her teachers to use laptops and tablets and online programs in the classroom. Like Semingson, she also wants teachers to use technology wisely. Cardoza said she doesn’t want students to just search for definitions on Google. She also tells teachers to have a Plan B if the technology they’re using fails or freezes, or the power goes out. Back in the classroom, fifth-grader Naomi Ette uses her fingers to write numbers and draw shapes on a Chromebook. She said it’s her first time using the device to solve math problems. Naomi said doing math this way isn’t just fun, it’s also helping her learn. 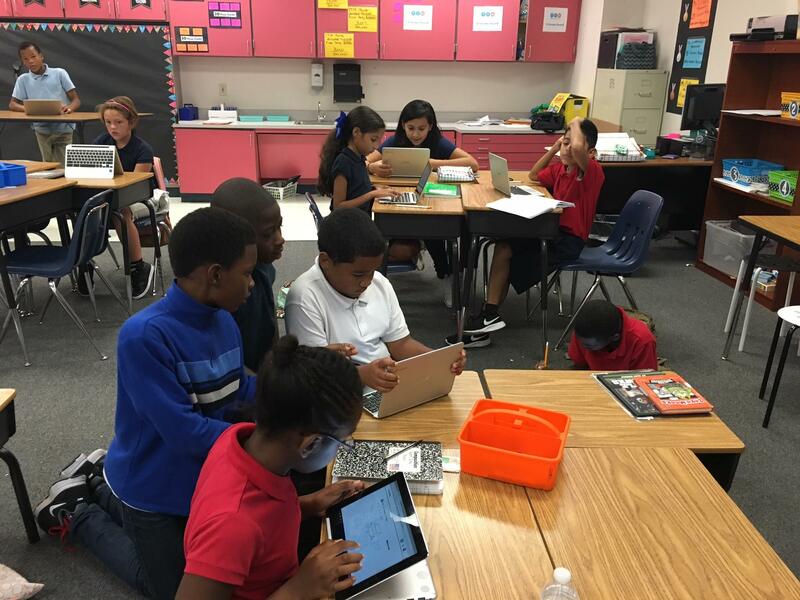 Students at McWhorter Elementary in the Carrollton-Farmers Branch school district use devices like tablets to do their assignments. Digital learning sounds like a teacher’s dream. But tech savvy kids and their devices present a whole new set of challenges. 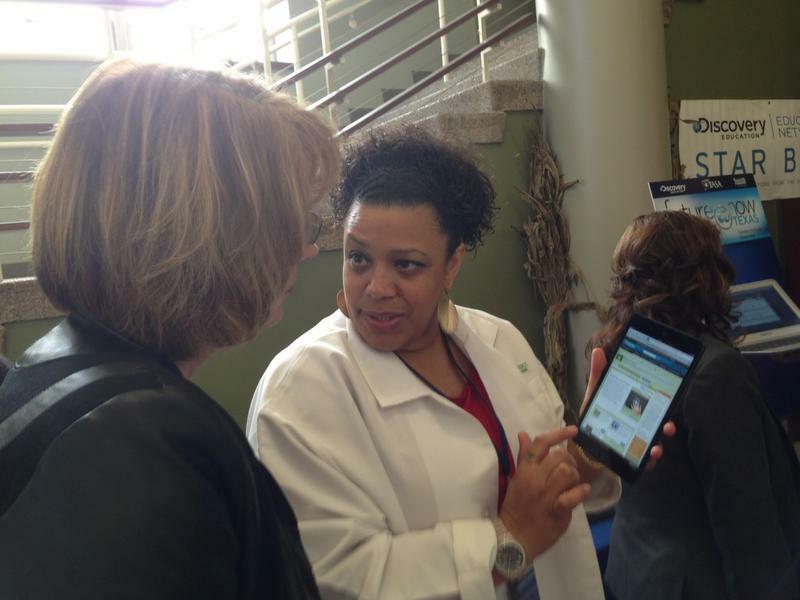 On Tuesday, a group of about 200 educators from around the state participated in a summit to discuss the latest digital teaching tools and strategies at Grand Prairie High School. The event was organized by Discovery Education, the Texas Association of School Administrators and the Texas Association for Supervision and Curriculum Development. 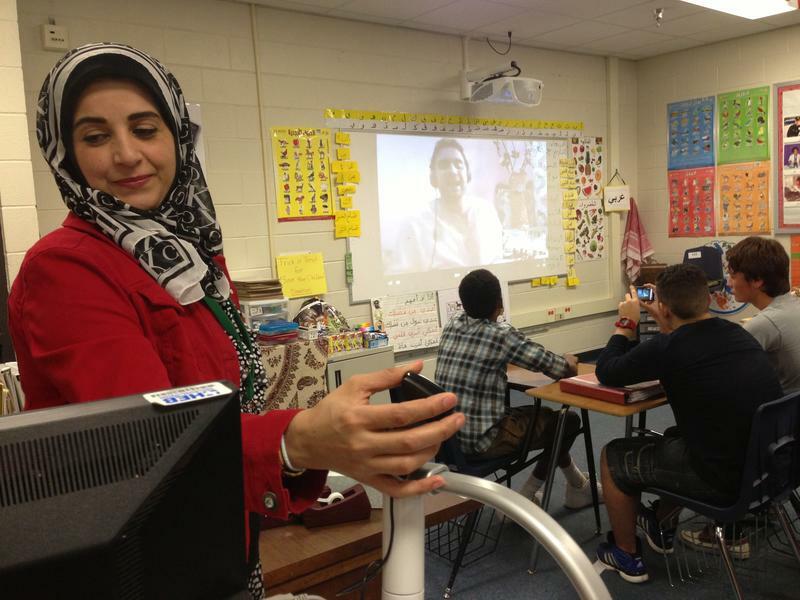 Students learning Arabic at Central Junior High in Bedford have three teachers – the two in their classroom and another one 5,000 miles away. In Morocco. Once a month, the class calls him up on Skype. The students practice speaking Arabic and learn something about breaking down cultural barriers, too. George Siemens, an expert in digital learning, will be spearheading a new research lab at the University of Texas at Arlington. The Learning Innovation and Networked Knowledge Research Lab, or LINK Lab, will look at how new technology – such as online learning – is affecting higher education. Two minutes. That’s all the time you need to teach your child something new. That’s the idea behind a series of instructional videos several North Texas school districts are offering parents. This new tool, called ReadyRosie, is getting preschool kids ready for the classroom.